Edward.Fish – Constitutionalism, Law, Programming and Stuff. For the past few years the mainstream media has been relating how Russia influenced the elections in favor of Donald Trump, costing Hillary the election, and while I have my own doubts as to the veracity of this narration it does bring up a valid point: foreign-influence on our elections is unacceptable. Indeed, foreign influence in our government itself should be highly scrutinized because of compromised loyalties. The threat they were concerned with, in particular, was someone with foreign loyalty obtaining the Constitutional appointment of the President to the role of Commander in Chief, and thus able to command the armies and navies in suppressing the people themselves. During the constitutional conventions they were debating on how to do this until John Jay sent a letter suggesting that “natural born Citizen” be the qualification for President. Now, if this was (and still is) a concern for the President, an argument could be made that there is some concern to be had for the Congress and Judiciary as well — especially considering how much money is given to foreign nations while we are more than $20 Trillion in debt for the former, and how the latter seems rather antagonistic towards border sovereignty. 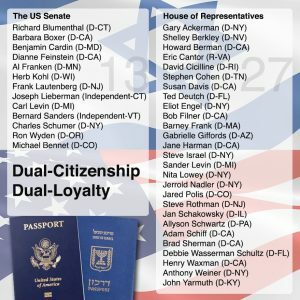 Whereas dual citizenship introduces the possibility of divided loyalties we request that the citizenship statuses, current and past, of all Legislators, Executive Appointees, and Federal Judges be made public — all of whom are public officials, and whose day-to-day duties impact the People of the United States and all corporations in the United States. Moreover, the “Emoluments Clause” (Art 1, Sec 9, Cl 8) clearly prohibits acceptance of presents or emoluments by foreign states to Officers of Profit or Trust, which all the aforementioned are, and the advantages conferred by foreign citizenship may well violate this clause, the purpose of which is clearly anti-corruption, and therefore should be available to public scrutiny to ensure such corruption does not exist. While that sounds good, it is a blatant falsehood: no man can serve two masters. In that case the author would hold to one, and not the other, and likely in an emotional judgment side with whichever had its story out first. As Proverbs 18:17 says: “The one who states his case first seems right, until the other comes and examines him.” — But in such a case would the other side even get the chance to state their case? — Obviously one side or the other will strive to control the story and, if they assume control of the proverbial airways, will strive to prevent ‘the other’ from said cross-examination. In any case, the question stands: Who are our leaders loyal to? 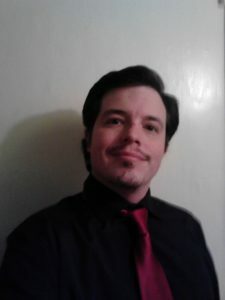 I have recently decided to run for one of New Mexico’s seats in the US Congress. Why should I be interested in supporting you? Constitutionalism: The Constitution for the United States should be treated as the supreme law of the land. Justice: Having a Just government is imperative not only to the peace and stability of the country, but to the legitimacy of the government itself. Anti-Corruption: It seems to me that a great many of our laws are optimized to foster and facilitate corruption (especially tax- and campaign-laws). Both the Republican- and the Democrat-Party are all-talk and no action. The Republican party bills itself as for government accountability and fiscal responsibility… yet what did they do in response to the NSA’s espionage program? Nothing. And when the Debt ceiling was reached, did they as-a-party push for expenditures to be cut rather than the debt ceiling to be increased? Nope. Likewise the Democrat party bills itself as for the working-man… but did the Democrat party push against the H1B visa fraud scams that are so prevalent in the technology industry? Nope. And let’s not forget the collusion and conspiracy the party did to promote Hillary Clinton above Bernie Sanders. So, which party are you running under? I’ll run under whichever party will take me. — Given my platform I don’t imagine I’ll “make friends” in the Senate, precisely because a lot of people, even in the Senate, are benefiting from the current culture of corruption. * — Justice and Anti-corruption could be considered the same thing. ** — Tax reform, balanced budget, term-limits, etc. This is my most popular brochure, to date. It seems to accurately portray the mindset of an uncomfortably large portion of law-enforcement officers as well as showing why the government seems to push for ever more gun-control. The short version is that the IPC should be done using streams of typed values, and that user-commands (of utilities) should be handled discretely and independent of the data-stream. Earlier (in 2014) I had the idea that the current ‘push’ being engineered was towards a sort of de facto caste system where the traditional Rights of the Englishman and, as the foundations for American citizen’s rights, the traditional Rights that Americans have enjoyed. We see this more and more as the government “picks winners and losers” by deciding to bail out businesses that would otherwise fail at the expense of taxpayers, ignoring every taxpayer who says “enough is enough” and continuing to sell its Citizens into a real slavery — $20 Trillion, and more, which is secured by the promise of the Citizen’s future earnings (i.e. the income tax) with no intention of ever paying it back is nothing less. As this continues we will see more and more codification of exemptions from the law to government agents, from the President down to the street-cop, to city employees to Congressmen. This is the world that they want: to be at the top, crushing down on the insignificant (you and I), lording their positions and power over us. 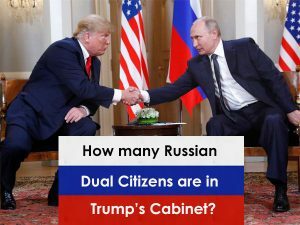 It is both my pleasure and extreme displeasure to have the first post of this blog be about treason as perpetrated by the Senate; it is pleasurable because it is a deeply interesting subject, displeasure because it illustrates & proves just how little our Senators care about our country and, by extension, us.